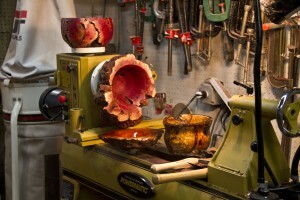 Artisans Turnings is a feature website for artistic turnings produced by Artisans of the Valley. Although incorporated into furniture making turning traverses well beyond the barriers of table legs, finials, and spindles. Master Craftsmen Michael Pietras and Eric M. Saperstein decided to create this site dedicated to their personally spun creations. The acquisition of a Powermatic 3520B lathe and an assortment of new equipment vastly expanded their capabilities, providing an opportunity to explore larger, heavier, and more complex turnings. Eric and Mike are now sharing their 2013 & 2014 pieces through Fortuna Fine Arts of New York, NY. Information about gallery events and tours of their artwork will be published shortly. 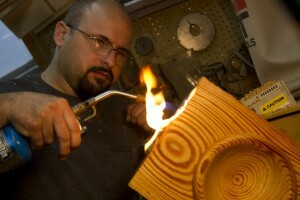 Master Craftsman Eric M. Saperstein was formally trained by his father, Stanley D. Saperstein Master Craftsman Emeritus. Receiving his master’s papers in 2008 after seven years running Artisans of the Valley and having already served as a journeyman and apprentice since childhood. Eric specializes in custom furniture, antique restoration, and woodcarving. The passion for turning developed out of a fascination for unique wood art and a desire to utilize the bounty of material being collected by Hurricane Sandy cleanup efforts. His personal favorite material is manzanita, a scrub tree found around the deserts of California, Mexico, and the surrounding areas. This material is being harvested through the cutting of fire breaks to help prevent the spread of wildfire. It is often burned or buried, its beauty neglected and its bulk returned to landfill. Eric is among the artists attempting to bring this vibrant material into the art world through turnings. Manzanita is known as a difficult material, prone to be unstable and most definitely containing inclusions of sand, rocks, and random objects. The simple fact that he heard when you’re thinking of turning manzanita, the best technique is “don’t” was enough to engage his curiosity. Experimentation lead to an assortment of abstract creations, natural and fully turned forms, epoxy stabilization tricks, and a very different product. Master Craftsman Michael Pietras received his formal training through various apprenticeships and seizing the opportunity for travel and private courses as often as possible. Operating Caribbean Custom Furniture for almost twenty years, he returned to New Jersey in 2011. Mike specializes in modern artistic furniture, mixed mediums, and custom cabinetry. His fascinations with turnings are inspired by exotic materials, abstract forms, and the challenge of difficult techniques. 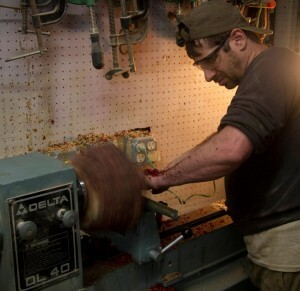 Mike’s favorite materials include spalted maple, and assortment of exotics, and exploring local firewood harvests. His eye for perfection will bring and extreme polish, a definitive balance, and elegant curves. The results? Well you can judge from our bowl gallery and video documentaries. We’re just getting this website off the ground so check back often for updates and new projects. For more background on Eric & Mike and Artisans of the Valley please check out Artisans Quarterly Review. 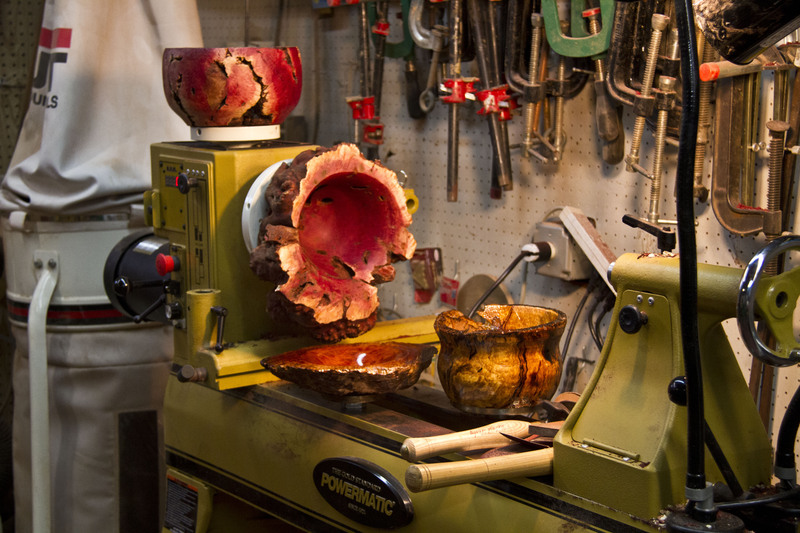 This periodically released newsletter features a variety of wood turning, custom furniture, restoration, carving, and sculpture, as well as guest artist features and profiles.